Custom made doghouses, storage buildings and small farm animal housing. 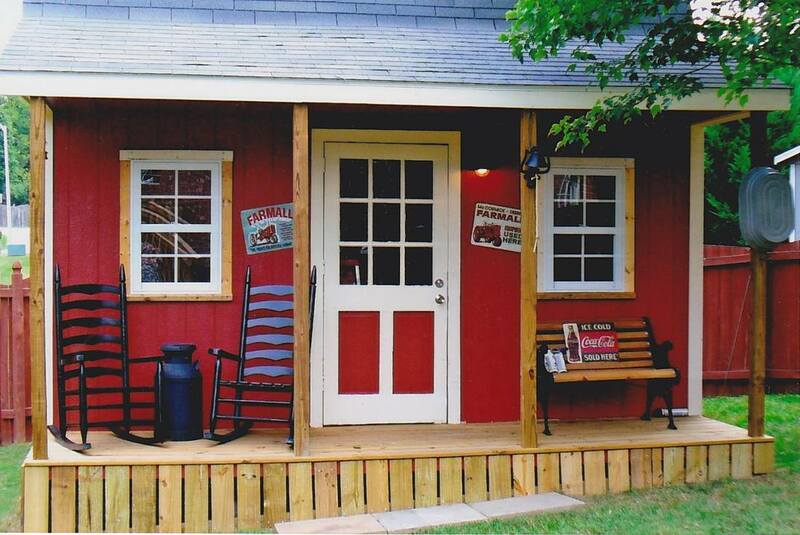 All are made of LP smart siding or treated lumber and treated plywood flooring. Our products are built to withstand the elements of nature for many years to come. CALL, TEXT OR EMAIL US TODAY TO PLACE YOUR ORDER! WE ACCEPT CASH, CHECK/MO AND VISA/MC. 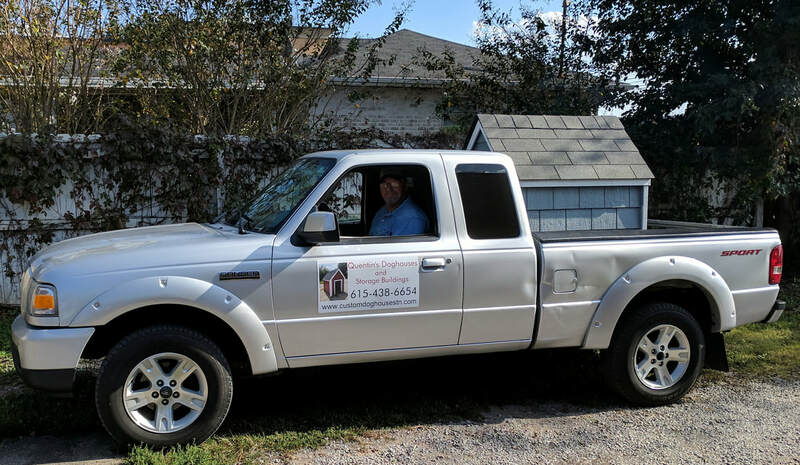 Quentin has many years experience in the carpentry field and we have been providing a carpentry service to our community since 2005. In 2015 we were blessed to expand our business with the addition ​of storage buildings and small farm animal housing. Quentin's Doghouses is proud to provide quality products that will last for many years at a fair price to our community. ​We offer free delivery on all doghouses and buildings within a 50 mile radius. We are also very flexible with delivery timing and are happy to schedule your delivery to accommodate your work schedule. Quaint one room cabin 10' by 16' with a 4' x 16' front porch. Perfect for small apartment, guest house, or a bathhouse for your pool!!! Custom built to your specifications. Quentin's Doghouses have built custom made doghouses for Davis Branch Blueticks located in Shelbyville, TN. Davis Branch Blueticks are the proud breeders of the University of Tennessee mascot "Smokey X"!! My Shetland Sheepdog absolutely love this doghouse. He sits on the porch a lot and sleeps inside every night. He immediately embraced it when we put it in the yard. It's very well made and trimmed beautifully. And even in the hardest rain it's completely dry inside (another benefit of having the front porch). Also because the door is to the left instead of centered, there's a great corner for snuggling on cold or windy nights." - Ben T.
We bought my 80 lb hound a doghouse from Quentin for when he is outside. We love it and our hound does too! Very quality built doghouse that will last for a very long time. Quentin even helped me load it up into my truck. Trust me you will love a doghouse from Quentin! They are very nice." - Adam W.
We are thrilled with our large dog house. It's actually being used for our pygmy goats and they already love it. Thank you for working with us and making it exactly how we wanted it!" -Tess T.
Quentin built a custom play set for our son's birthday. We were under a time crunch and it was over the Christmas Holidays. Quentin was awesome, working in the cold and at times dealing with very uncooperative weather. Our son was over the moon, and thought this was the best gift ever. We've had it for 3 years now, it is large enough that our son will have many years to enjoy it before he out grows it, and it is as sturdy and as crisp as the day it was built. Thanks Quentin!" -Darla B.
Quentin's Dog Houses & Storage Buildings. 2017. All Rights Reserved. Designed by EMS.